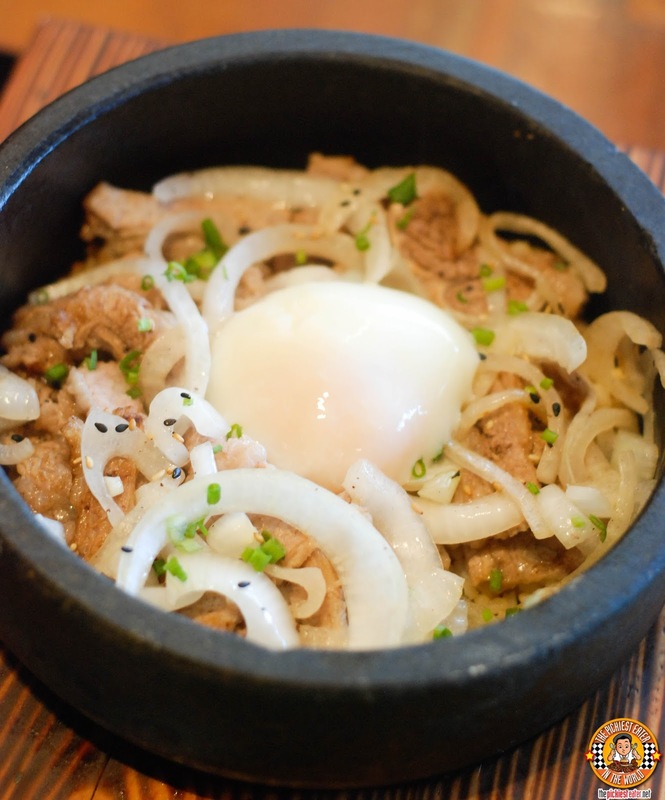 THE PICKIEST EATER IN THE WORLD: YABU'S LATEST HIT: GYUDON!! 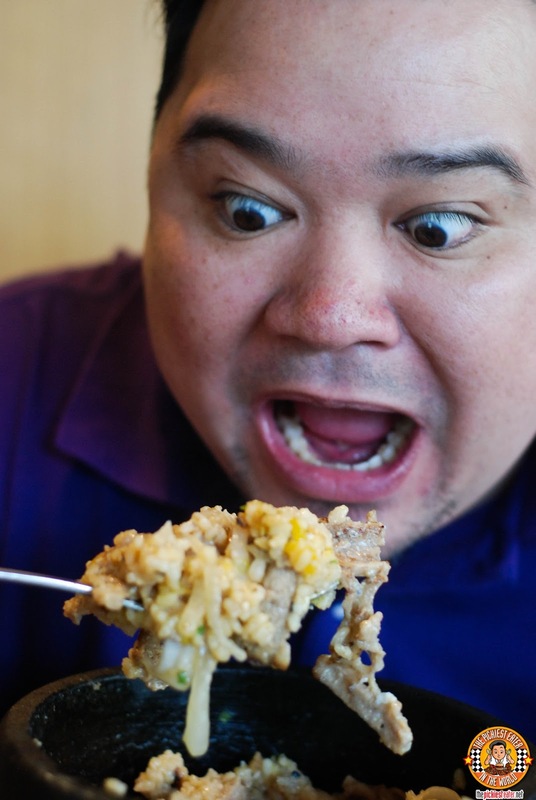 Already having definitely stamped their claim as the country's number one Katsu House, Chef Lee Jose and his kitchen is out to show the public that they aren't a one trick pony. 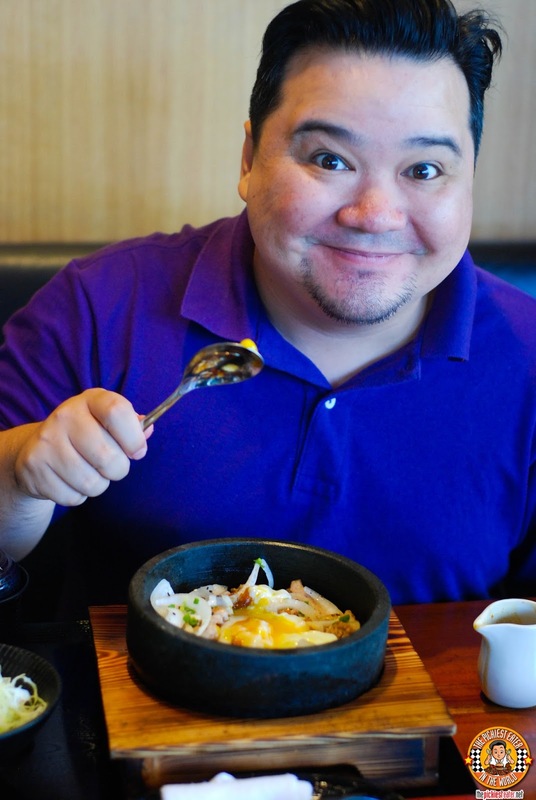 Chef Lee and his team flexed their culinary muscles to come up with more Japanese dishes that may stray away from the original Katsu concept, but still carries the excellence in food quality that has been closely associated with the Yabu brand. Mouth watering strips of Premium U.S. 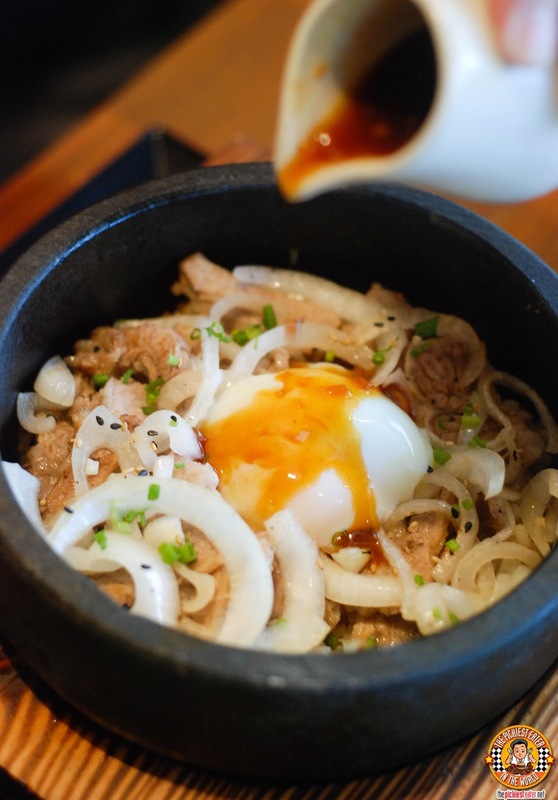 Beef Belly, mixed in with delicious, sauteed onions, with a perfectly cooked poached egg nestled in the center of the stone bowl that continues to slowly cook the food as you dine. Though the natural flavors of the beef and onions in itself is already quite exceptional, the Honey Soy Sauce that you pour over the bowl takes the dish into a whole new level. The thick sauce adds an amazing element of sweet and salty to the dish, helping bring out the flavors of the meat. 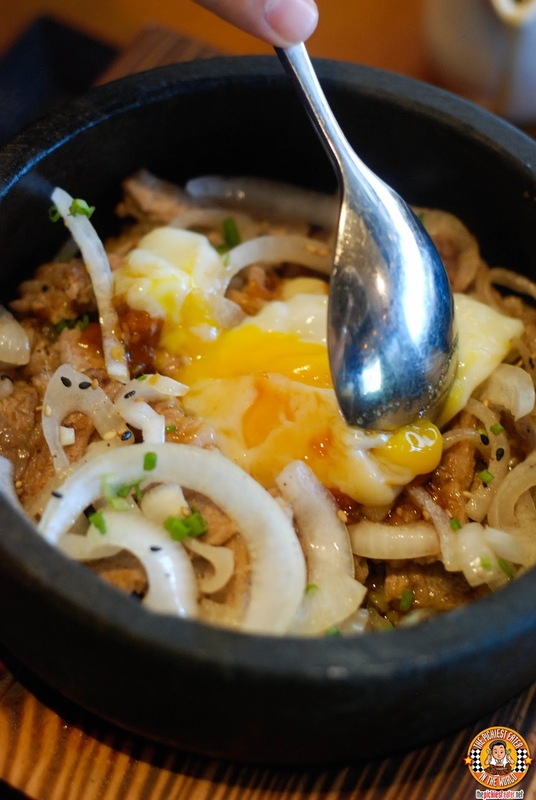 You mash everything into a beautiful mess, letting the yolk spread throughout, allowing it to further cook into the various ingredients, adding a touch of creaminess to the dish. Once everything is mixed in completely, take a big scoop and dig in! 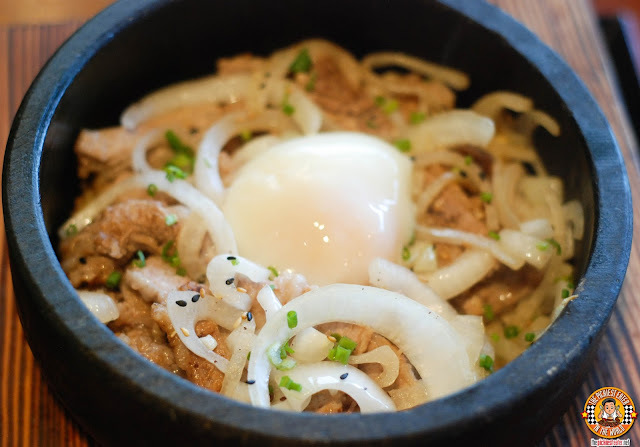 The dish is truly amazing, and a welcome inclusion to Yabu's ever- growing menu! To cap the meal off, Rina and I shared Yabu's new Kuromitsu Ice Cream, which was pretty awesome. 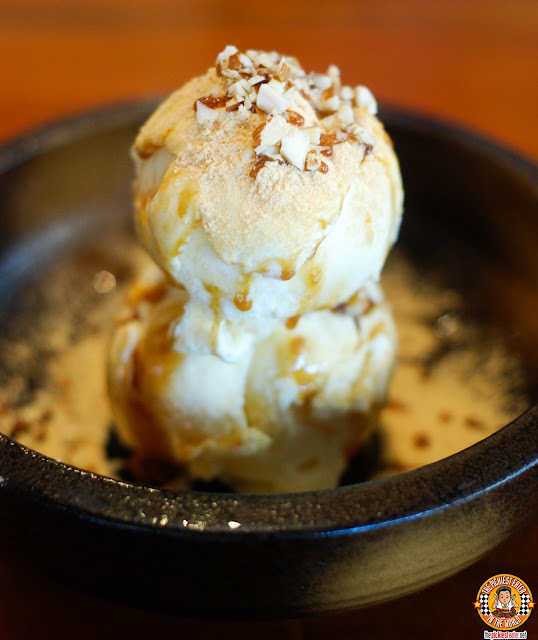 Two scoops of creamy Vanilla Ice Cream is drizzled with Kuromitsu, which is actually a lightly sweet syrup. Afterwards, the scoops of ice cream is dusted with kinako, or Roasted Soy Flour, then speckled with almond bits. The blend of sweetness and textures made this a really appetizing dessert, and a nice way to end your heavy meal. I can't help but be impressed with the consistency in which Yabu unveils one excellent dish after another, constantly keeping their customers on their toes, and refusing to rest on their laurels!